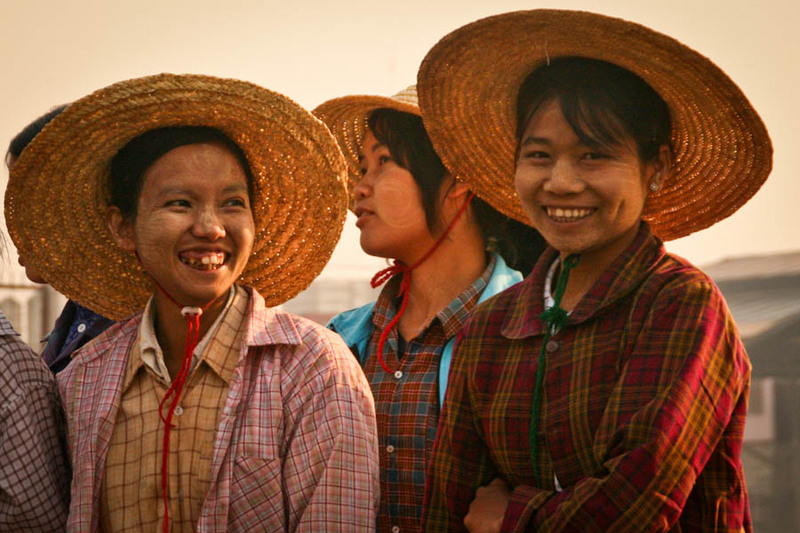 From sharings of Vietnamstay's travelers, top 10 reasons to travel to Myanmar are listed below. Check them out to see why others spend their vacations in Myanmar and note for your coming trips to Myanmar. This ancient city of Bagan boasts amazingly stunning view of vast temple site to rival the magnificence of Machu Picchu and Hampi. Seeing the sunrise in Bagan is one of the ultimate travel buck list you should do before dying. From the 9th to 13th centuries, the city was the capital of the Kingdom of Pagan, the first kingdom to unify the regions that would later constitute modern Myanmar. During the kingdom's height between the 11th and 13th centuries, over 10,000 Buddhist temples, pagodas and monasteries were constructed in the Bagan plains alone, of which the remains of over 2,200 temples and pagodas still survive to the present day. The result is a sprawling landscape of remote, temple-studded plains, lush with other-worldly magnificence that can be explored and experienced on foot or by bike. Anyone who has visited Bagan will tell you that the best way to see Mandalay’s ancient temples is by ascending the landscape in a balloon. Australian Brett Melzer and his Yangon-born wife, Khin Omar Win, started Balloons over Bagan with a single balloon in 1999 and have been sharing the aerial beauty of rural Myanmar with visitors ever since. Acrophobics who want to keep two feet firmly on the ground will still want to make an early morning trip to the area to catch the unusual sight of these red balloons dominating the early-morning skyline. Burmese food is not only healthy and delicious, it’s also rarely eaten outside the borders of the country. Given its geographic location, the cuisine is a mixture of Thai, Indian and Chinese ingredients. Traditional dishes include Mohinga — rice noodles in an orange fish sauce; Shan Noodles — traditional noodles stir-fried with chicken in bean sauce, vegetables and peanuts; and Onnokauswe — noodles simmered in coconut milk. Curries and spicy soups are favourite with locals. Come hungry for flavour and thirsty for knowledge. Idyllic stretches of white sands and palm-lined shores do not come much more heavenly Ngpali Beach. Located on the Bay of Bengal coast in Rakhine State, the picturesque sun spot is a beautiful part of the world to rest, unwind and watch the fishermen return to the shores and unload their catch. What’s more, there are plenty of other untouched beaches, coves and islands just like this, stretching along the coast of Myanmar. Those who want to make friends with locals should travel to Pathein. 25 miles west of the area is the closest thing the country has to a partying beach resort. Chaung Tha is where locals head when they want to relax, play beach games, have a drink and set off Chinese fireworks in the evening. Locals, generally, are not only friendly to Westerners, but they’re also keen to show you around their beautiful country. Practicing English is important to them, so you’ll often be approached with a “Hello” and a genuine smile. No visit to Myanmar is complete without a visit to this 2,500 gilded stupa, which sits at an impressive 360 feet high and is encrusted with 4531 diamonds; the largest of which is a 72 carat diamond. Located west of the Royal Lake on 114 -acre Singuttara Hill in Yangon, Shwedagon Pagoda is the most sacred and impressive Buddhist site for locals as it is believed to contain relics of the four previous Buddhas of the present kalpa. These relics include the staff of Kakusandha, the water filter of Koṇāgamana, a piece of the robe of Kassapa, and eight strands of hair from the head of Gautama. If you’re looking for some off the beaten path trekking, you won’t find a lusher landscape than that of Burma’s jungle-clad limestone peaks, punctuated with hidden monasteries and relics of a lost time. Most backpackers opt for a two day trek around the stilt villages of Inle Lake but for a real experience; head deep into the Shan highlands or South to Hp-Pan, where there are spectacular views to be soaked in. Covent Garden’s living statues have nothing on the optical insanity of the Rock Pagoda. According to legend this massive golden boulder sitting precariously on the edge of Mt. Kyaiktiyo is able to balance because it’s perched on a strand of Buddha’s hair. This golden rock is a miracle to many devout Buddhist’s and has been a point of pilgrimage for the both the religious and not-so religious, curious to witness the precarious sight. You wouldn't think of Myanmar being synonymous with retail therapy, nor are there glittering Singapore-style shopping malls. But when it comes to local arts and hand made goods, you can do some healthy damage to your wallet and enjoy every minute of it. From bronze statues and woodcarvings to hand woven scarves and freshly rolled cigars, silver and goldsmiths and artisans are all found here in abundance. While bargaining for multiple items is common, you'll find great prices regardless on great souvenirs while supporting people who still use traditional methods to create objects of beauty. Check out the lacquer ware in Bagan. Lacquer is found everywhere, at temples, in markets, and artisan's ateliers. Local guides will know the best shops where immaculate work in all price ranges can be found. If you’re looking for an inexpensive international adventure, Myanmar should be top of your list. Sadly the sudden spike in tourists has inflated the cost of hanging your hat, but budget-friendly hostels are still dotted around the country and can cost as little as US$20 per night. Lodgings aside, dining like a king in Myanmar is easily afforded. A traditional meal will cost you just one or two pounds, while a beer to swill it down with will set you back just 70p.